The DRY-UP™ Dimple Board is a very tough and long lasting plastic membrane that prevents moisture from passing through. It is also “dimpled” to allow a wall to breathe, allowing moisture to condensate outward so it falls by gravity to a drainage system. The DRY-UP™ Dimple Board is used with the DRY-UP™ Geo Channel to direct the water from the basement walls down into the DRY-UP™ Geo Channel drainage system on both interior and exterior applications. It has the added benefit of keeping back fill from touching the foundation wall. The DRY-UP™ Dimple Board membrane can also be used to capture the water from basement walls, directing it down into the DRY-UP™ Water Tunnel. 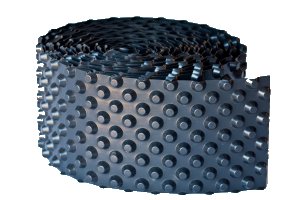 The “dimples” in the DRY-UP™ Dimple Board create drainage space which allows moisture to be directed to the DRY-UP™ Water Tunnel and channeled away to the sump pump. The DRY-UP™ Dimple Board can also provide a barrier on exterior basement walls preventing soil and moisture from touching the foundation walls. It is fastened mechanically (by a ramset gun and fasteners) and is not affected by shifting, cracking, and settling of the foundation wall. This is a quality dimple board that can be bent around corners without cracking, giving a protective membrane against any moisture intrusion. The DRY-UP™ Dimple Board is used with the DRY-UP™ Geo Channel at the bottom of the footing to drain water away from the exterior basement walls. DRY-UP™ Dimple Board can be used under a sub floor or over concrete to eliminate cold and damp floors. This also creates an effective vapor barrier to protect flooring put on a basement floor. See the Kozy Floor Liner. The DRY-UP™ Dimple Board can be also used as an underlayment in crawlspaces before installing the Healthy Home Crawlspace Liner.